This year Nicole’s second costume for school is a Scientist, “like Mommy.” One morning, as I was driving Nicole to School, we were discussing what she wants to be when she grows up. One of the options we discussed was scientist. I told her mommy was a scientist and she got really excited about being a scientist, just like like mommy. We had already settled on the girls being astronauts for Trick or Treating, so I told her most Astronauts are also scientists, and asked her if she wanted to be a scientist/astronaut for Halloween. My proposal was met with a resounding yes. I love how non-conventional my little girl is! 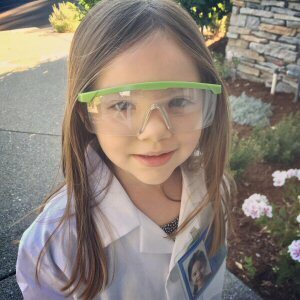 I also fear that she will regret her decision once she sees the other girls in their Disney princess costumes, so we decided pretty early on that she wasn’t going to be a stereotypical scientist with tapped glasses. Scientists come in all shapes and sizes, after all. She’s going to wear her favorite dress under her lab coat, because why not? My two favorite details of her costume are her badge, and her astronaut necklace. 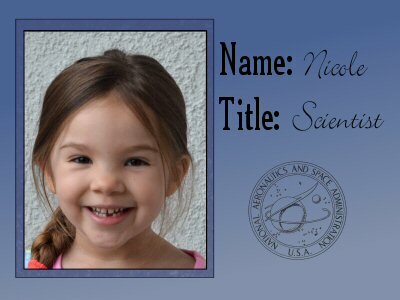 The badge has her picture from her first day in kindergarten, title and the official NASA logo. She is an astronaut/scientist after all! The necklace is a special surprise I’m going to give her the day of her school party. I had dubbed Alexis’ school costume “color explosion.” I was going to put her in a her rainbow fairy skirt and give her a rainbow lei garland. I thought she’d love all the colors. Unfortunately they had a dress up day earlier this week, and while my not quite three year old was initially content in her costume, she got upset when she saw all the other Elsa, Moana, and super heroes. Oh Irony, that’s what I was worried about with Nicole! So Alexis is going to her school party in Nicole’s old Wonder woman costume from last year. Crises resolved. Most of our second costumes came from the dress up corner. The safety glasses were an additional $3.59 for a pack of six, and the necklace was $3.39. I did purchase a Moana costume for Alexis when she was sad, but the only one I could find was a 4-6x. 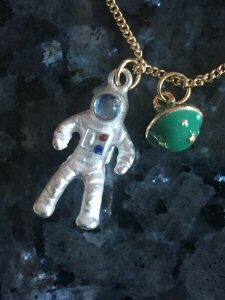 Technically she sometimes wears 4, but that size was too big in the astronaut. I was worried we’d risk another round of disappointment when the costume she coveted didn’t fit. When the Wonder Woman costume sufficed I decided to keep the Moana costume for the dress up corner. We should get a lot of good use out of it for a few more years still.